1973-1985: The Golden Years - LFChistory - Stats galore for Liverpool FC! Interviewed shortly after the 1973 League & UEFA cup 'double'', Bill Shankly pointed proudly to the glistening First Division championship trophy and described it as the club's "bread and butter". He said that being successful in Europe had been good for the club and good for the country but that winning the League was what the club wanted to do "all the time". Nothing has changed about his philosophy 30 years later but doing well in Europe raises the profile of a club beyond these shores and even though nobody knew then, probably not even Shankly himself, that the 1973-74 season would be his last as manager, he must have been excited at the prospect of again pitting his wits against Europe's finest and attempting to bring the prestigious European cup to Anfield for the very first time. But Bill's dream ended in disappointment before autumn turned into winter. His players made very hard work of beating the minnows from Esch in Luxembourg 3-1 on aggregate and then went out to Red Star Belgrade in the second round. Chris Lawler - such a prolific scorer from full-back in Liverpool’s early European days - grabbed what appeared to be a priceless away goal in Yugoslavia but Red Star repeated their 2-1 victory a fortnight later at Anfield with wonderful strikes from Lazarevic and Jankovic. Yet another Lawler goal was "too little, too late". There was still a lot to learn before the greatest prize of all could be won. Shankly's parting gift to Liverpool was the F.A. cup so for the third time the club entered the Cup Winners' cup. The plucky part-timers from Stromsgodset in Norway were destroyed at Anfield 11-0! Nine different players scored; only Brian Hall and 'keeper Ray Clemence failed to find the net that night. The Norwegian goalkeeper's name (Inge Thun) allowed the local sportswriters to print a "THUN-DERSTRUCK" headline the following morning! The return game was switched from the tiny stadium in Drammen where the Norwegians played to the national stadium in Oslo and marked the return to competitive action of Kevin Keegan after the long ban he and Billy Bremner had received following their sending-off in the Charity Shield back in August. Ray Kennedy scored the only goal of the match in Oslo but it was Keegan who gave the Reds a half-time lead when Ferencvaros visited Anfield for the third time in the next round. It looked for a long time as if that would be the only goal too but a last-minute equaliser from Mate gave the Hungarians a valuable away goal and changed the whole complexion of the tie. In Budapest Liverpool managed a goalless draw but went out of the competition, and to make matters worse Tommy Smith received a fine and a European ban for feigning injury when a missile was thrown on to the pitch late in the game. 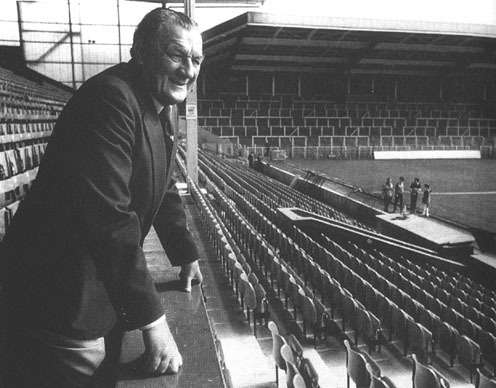 Bob Paisley considered his first season in charge to be disappointing, even though finishing as runners-up in the League would not have been seen as "failure" at any other club! But he was very astute tactically and one of his most important decisions during the 1975-76 was to transform Ray Kennedy (signed from Arsenal on the same day that Shankly had announced his retirement) from a lumbering forward into a creative midfielder. Kennedy played up front at Hibernian in the first round but was substituted by John Toshack in the second half as Liverpool tried to equalise Harper's early goal. Ray didn't figure at all in the return game but the big Welshman certainly did and his three goals, all headers, saw the team through to a narrow 3-2 aggregate victory. Ray Clemence's vital penalty-save in the closing minutes at Easter Road had prevented Liverpool from going out on the away goals rule. An impressive 3-1 away win at San Sebastian in the first leg of the second round virtually killed the tie off there and then and when the Basques from San Sebastian came to Anfield two weeks later they were comfortably thrashed six-nil. By the time Liverpool went to Poland to play Slask Wroclaw at the end of November, Ray Kennedy had been installed in his 'new' role with increasing effect and he scored the first of Liverpool's two goals that afternoon in freezing conditions, the other coming from Toshack, before a hat-trick from Jimmy Case finished the job off at home. In the quarter-finals Liverpool were again paired with Dynamo Dresden, the club they had beaten at the same stage of the 1972-73 competition. They didn't manage a win in Dresden as they had three years previously but were satisfied enough with a 0-0 score-line, especially as another brilliant penalty save from Clemence had prevented a narrow defeat. For the second time that season, Ray's agility would keep Liverpool in the tournament because after Case and Keegan had given the Reds what seemed to be comfortable lead in the home game, a strike from Heidler led to a tense last few minutes with the threat of a second German goal which would have put Liverpool out. The wonderful setting of the Nou Camp in Barcelona was the scene for one of the club's best-ever European performances. Playing in an all-white kit, the team's defensive performance was immense and they snuffed out the threat of the brilliant Cruyff and the creativity of Neeskens. There was a bonus too with John Toshack driving home the only game of the tie after just 13 minutes to keep the home supporters quiet. A noisy Anfield awaited the Catalans but this tie was still in the balance and the first half was very even. Five minutes after the interval, Phil Thompson prodded the ball over the line from six inches out and it looked to be over but within a minute Rexach had equalised. Just as against Dresden in the previous round, this led to a very tense finish but Liverpool held out and then heard that their final opponents would be Bruges, who had beaten Hamburg 1-0 at home after a 1-1 draw in Germany. The two legs of the final were either side of the last, vital League match of the season, the game which would decide whether Liverpool or QPR would win the title and whether Wolves or Birmingham would be relegated. But Anfield was silenced early on in the home leg as the Belgians raced into a two-goal lead. A dreadful header by Phil Neal fell woefully short of Ray Clemence and Lambert raced in to lob the ball over the goalkeeper and into the net. Only minutes later a sensational strike by Cools left the Reds staring at a bad home defeat. There were no further goals before half-time and in the interval Paisley decided to send on Jimmy Case in place of John Toshack. It was a move which had an immediate effect. Ray Kennedy's thunderbolt reduced the arrears before the same player dragged a shot against a post and Case, following up, stabbed the ball home from close range. Then Heighway was chopped down in the area and Keegan calmly sent Jensen the wrong way from the spot. Three goals in five astonishing minutes early in the second period had completely turned the game round. There should have been further goals too in the time that remained but probably Liverpool were just happy to be in the lead after such a terrible start, and there was also a late scare when a good chance was put wide by one of the Belgian forwards in the closing minutes. The championship was won in dramatic style at Wolverhampton and Liverpool set off for Belgium knowing that if they could hold out for a draw the trophy would be theirs for a second time. But again there was an early shock. Tommy Smith was penalised for handball and Lambert drove the penalty out of Clemence's reach. But Liverpool's reply was instant. A free-kick on the edge of the box was touched sideways by Hughes for Keegan to drive into the net. The rest of the game was pretty even but as time wore on Bruges put more into attack and Liverpool not surprisingly more into defence, knowing that a draw would be enough on the night. There were still some heart-stopping moments though - one shot against a post and a cross a few minutes from time which eluded players from both sides when only a touch would probably have resulted in a goal. 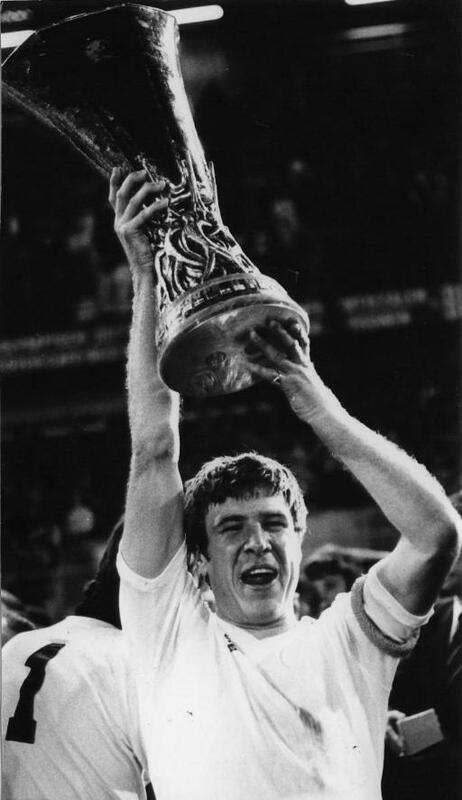 The final whistle was greeted with great joy by the thousands of Liverpool fans who had made the short journey across the Channel and Emlyn Hughes stepped proudly forward to receive the trophy and complete the club’s second League and UEFA cup 'double' in four seasons.